Finally, after over 9 months of directed training, 11 months of waiting, the Marmotte has been completed. It is done. We got around. Completed. From start to finish, it really is an epic event. Everything from the scale of the mountains to number of cyclists to the amount of water I had to drink (somewhere about 10 bottles I think excluding what was dunked over my head). But even with the massive numbers, things were well organised. Everything moved pretty quickly and didn’t leave us waiting in the sun too much – which was pretty hot for a lot of the day. 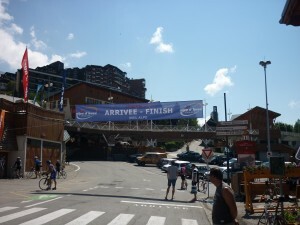 Reports of 39C on the Alpe d’Huez yesterday! The day begins by hoarding everyone into different gated sections for the start. I had heard that is was like cattle pens, but these expanded out pretty far for our group. For the front group (1-200), they were in a small area like a cattle pen but then it is a smaller group. It begins by people ahead moving slowly forward and everyone around you slowly shuffling ahead. As you get closer to the start line, you hear the band, pass by it about the time you get to cycling, then across the timing mats and the day begins. Immediately groups begin forming, some fast, some slow. Then there are those that seem to cycle like they have rocket packs. I did manage to stay with a group and bridge up at different times all the way to the Glandon. Even on the Glandon, right up through the first climb section, groups and pace lines stayed together. Actually it was my first time hitting a roundabout in a large group at high speed, and it is amazing how it strings out around the roundabout, then bunches back up straight afterwards. We had been warned that this would be 3-4 cyclists deep the whole way up the climb when we hit this, and it was for the most part. Coming past the EDF electricity station, I was on the front of a group for a bit but obviously I hammered it a bit too hard and they dropped off my wheel for a while. I hadn’t fully gotten everything together on the subsequent descent when I locked up my rear wheel momentarily. Not a fun thing to do. It actually happen again at the first descending bit of the Glandon climb. I once again locked the rear after overtaking a Tandem and ended up a foot into the grass. Quite a few others did similar things around the course. Other than that, the climb was pretty much a case of just keep pedalling and watch the heart rate so as not to over cook it, which is surprisingly easy to do if you stay on the wrong wheel for a while. The Glandon descent was meant to be removed from the timing so just after rounding the hotel before the summit was the timing mat. It took a few minutes to figure out how the water works. At one section there is cups of water, and another taps for bottles. I spent a few minutes trying to get a bottle to fill my bottles before someone said this. The stop had some food, soft jellies which were amazing, but not as amazing as the cut orange pieces. They really are super to much on and get juice from at a time like that. Very refreshing. Being neutralised, a lot of people were taking it slow. Very slow. Some weren’t and we ripping by like we were standing still. After a bit, I jumped in line with a group and picked up the pace with them and even though we were doing 40-50km/h, guys were still flying by occasionally. The downside to the slow people was that the rims heated up. And for those that have never seen this, rims on long descents can heat up quite a bit. Enough to cause a blowout. And blowouts there were a lot of. Yet another reason I didn’t take it all too fast as the smell of brake pads was pretty strong. The not so flat bit. Advise for this section was take it easier than you think you need to. And if you are on your own, sit up, wait for a group. One will come. Luckily I had been in a group from the descent and they were going at a descent enough pace. It allowed me to sit in for the first 5 or so minutes and get some much needed food into me. It immediately became apparent the differences in ability on the first little uphill. No more than 25m of climbing but the rate at some people went backwards was insane. Almost like someone had pulled their brakes. 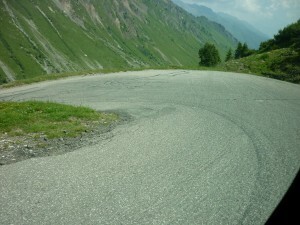 The most interesting part of the descent would have to the speed bumps on a long straight road where it flatten out. While on any other day these would have been up and over, at the speed we rolled onto them, well I got airborn coming off them. For about half of this section, the group held together. I think I lost contact or the group split a bit mid way through. But for whatever the reason, I was in a smaller group for a while, then behind only one person, then bridging gaps and watching people fall from my wheel. The Télégraphe did come all too soon in some respects. If you were to stand all four climbs on their own in similar situations, the Télégraphe is probably the easiest of the lot. Not so in the Marmotte. We hit the bottom sometime before 11 meaning things were starting to heat up, and heat up they did. I later heard that the village below the Télégraphe was 35C at 11am. A sign of things to come. About half way up there was a water truck at the side of the road with some jellies. A quick stop and another bottle fill and back on the road. By this stage things felt hot but I was still managing pretty well. The worst part was the road works near the top. Yes the organisers had people there directing traffic, but we a solid stream of cyclists for however many hours, things did bunch up for a while. This gave me a chance to walk by bike for a little bit while waiting for traffic. Another fill of the bottles at the top and it was on to Valloire. 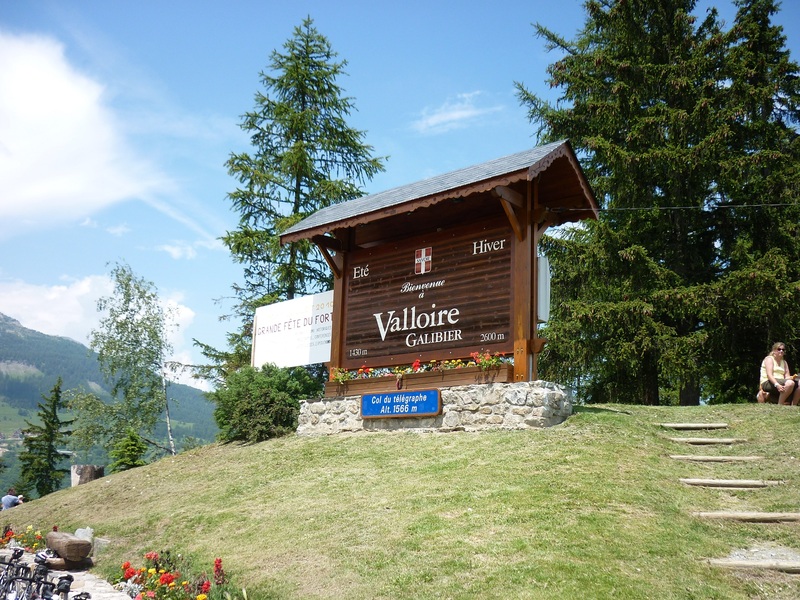 When we climbed the Galibier on Tuesday, it became overcast and cooler when we passed through Valloire. Not so today. Yes there was some drizzle for a short period while climbing, but it was a very strange cast of ah cold rain drops, but everything else is still burning hot. Even upon reaching the top, I was standing around for a few minutes with the jersey unzipped before I even started to cool down. Unfortunately there isn’t much else to this climb. It was an hour and half of slogging away and keeping the pace. The most memorable point was passing one of the corners were a few dutch cyclists were sitting on deck cars outside of a camper van that was there to support them. They all looked very refreshed and were enjoying their ice cold cans of coke. Really, the only way to live. A 40km descent may sound great, but when that 40km descent has some rolling roads and a few smaller climbs, it becomes a bit harder than you set yourself up for, as I found out on Tuesday. Luckily, doing these in a group is a fair bit easier and once again allowed me to relax some for the first section. The relaxing stopped about 12km when some not so good riders caught up. Descents are not fun when guys pull in front of you, pull the brakes, and then start weaving. This made me hunker down and up the speed a little leaving them behind. An aside, passing cars at 50km/h isn’t always as scary as it seems. A group of faster riders then began forming leaving us about 20 strong by the first uphill section. Unfortunately for me, almost all of them had started 20 minutes after I did and were a fair bit faster on the hills. This resulted in some of my highest heart rates for the day while fighting up the hills after them, usually having to catch them again on the descent after the climb when everyone started bunching up again. It held together until the flat section rolling to the bottom of the Alpe, the pace drifting off somewhat. But onward, and upward to hell! I’ll start by echoing the advise given to me by others. The Alpe will be hot. It will be hard. You will suffer. And you will NOT go as fast as you have on other ascents up the Alpe. Little did I know how much I’d suffer or how hot it would be. My initial plan for the day was the leave my timer on and not stop it. That way when I got to the Alpe with less than an hour to go before the 8:27 Gold cut off time, I’d take it easy and enjoy the finish. Not so. I rolled to the bottom with 7:10ish on the clock. This made me push through the food stop and along the short flatish part, exactly like I said I wouldn’t. Immediately on the climb something became very apparently. People everywhere were suffering, and suffering badly. My fast pace made me look like I was going well as I past a load of people during the first 30 seconds, presumably as they were smart and had just come out of the food stop. I stopped passing people as we hit the steep section and I settle down somewhat. I do say somewhat as I still was pushing a little hard as I knew this was where I’d make up the most time due to my climbing style. So push I did. Within a few hundred meters, the water had heated back up in the bottles again, and I was almost bone dry. A litre of water over my head and I was dry within 5 minutes. I later found out that it was 39C at the bottom of the Alpe when we rolled on to it. Something that explains why everything was heating up so much. The rest of the ascent, including another water stop at a waterfall at the side of the road, was just a case of push hard, but not too hard as too burn up. So two water stops, one pee stop. Not too bad. This will probably remain the hardest few minutes of my life for quite a while to come. And all because I didn’t read the race book properly. As any cyclist knows, there comes a point when you start doing some mental maths and realise you are tired because simple things are taking way way too long. For me, the mental maths started early in the day on the Glandon when I realised I was well up on the pace I was expecting. On the Alpe however, it became nearly constant. Always trying to multiply or divide something, seeing if I’d get that magically cut of time of 8:27. Rolling up at the bottom, I really felt confident. 75 minutes to do the ascent, one that had taken 61 previously. One I now knew I could push harder in certain sections. Yes, I was quietly confident. As the water stops rolled through it did begin to change, and I remember getting along the faux flat near the top, the section where the road forks. I was trying to work out how fast I needed to go compared to what I was doing. It was taking minutes to do the maths. More so, the ascent was to finish at 175.3km, not the 174.4km I had been planning. This could only mean that the ascent was longer, something that was confirmed at some corner with a nice sign telling me the summit was Xkm up. The graph above is that of my speed along the Alpe d’Huez. I had realised it would be close. A matter of seconds to reach the time cut off for Gold. My HR was rising so I decided to click up and push harder. And harder and faster I went. 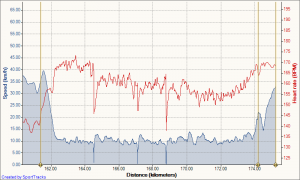 Luckily the top started flattening out letting me continuing upping the pace. I rounded the last corner and entered the gated area. All the time watching the precious seconds tick away. Then finally I crossed the line – hitting stop as I did. La Marmotte was done. I’d finished. 4 Seconds was what it came down to. The training, the suffering. All for 4 seconds. Yes I’d get my gold due to the Glandon descent being removed, but it wouldn’t be a real gold. All for 4 seconds. A quicker pee stop. A quicker water stop. Pushing through the roadwords on the Telegraphe quicker. Not breaking as hard during the Gliber descent. Pushing just that tiny bit harder on the ascent. Anything. I was too sore to be annoyed. My back was stiff and I needed something to drink. Luckily there was a stand with more recovery drinks just over the line which helped. After putting the bike in one of the stands, I lay down for a while. Resting. Trying to take in everything that had happened. Trying to understand how 4 seconds could influence everything. I think I was up the Alpe for around an hour and a half. Ate the food they gave us, got my cert and returned the timing chip. My friend Peter hadn’t arrived up so I decided to head on back to the house. Upon returning back, one of the first things I did was pull out the page with the time cut offs. Mainly I was trying to figure out if the cert said Gold or Silver. I honestly couldn’t remember which was which. But once I opened the page, I saw it. Cat C, 8:29. I had actually made it and not known it. I did what I had hoped for and earlier in the week doubted I could. I had made the real gold time. Right now it is just over a week after the event. On the day of the event I had publicly said that I didn’t think La Marmotte was as hard as everyone made it out to be. I still stand by this. My point being that the heat pays a monumental part how hard the day is going to be. Now for someone who doesn’t handle the heat well (i.e. me) to say this, something has to be up. Calorie wise, the Marmotte wasn’t much beyond the Wicklow 200 I had completed a few weeks before. And while it was definitely harder, much harder, La Marmotte wasn’t as truelly hard as I expected. Yes the heat made me suffer, but not as much as I did during an ascent of 3 Rock the week previously while training. Maybe the event and its magical powers helped me feel it was easier, who knows. On the Sunday after it I went out for a training spin. For the first time in as long as I could remember, my muscles were still a bit sore and stiff. Cycling was also hard. The kind of hard I get when I don’t train for 3/4 days, except this time my heart rate was not going up. No matter how I pushed, my legs were giving out before it went up. Sprinting on a hill raised it to 158 but then my legs gave out and said no more. It was surreal. Honestly something I had never experienced before. The following week I remained tired. But more just the kind of tired you get from lack of sleep than anything else. We hadn’t been sleeping properly during the week in France and it was starting to catch up with me. It finally hit home on the Saturday after when I didn’t get out of bed until 12:30. Part of this may also have been due to one of our neighbours having a party during the night and waking us up multiple times, but I still felt tired so I’m putting it down as a bit of both. Would I do it again? Simple answer is it depends. I don’t think I’d just do La Marmotte by itself. If I was to go back, it’d be for La Grande Trophie, a series of events over the week. I know I’m strong enough for a Marmotte Gold so I’ve nothing left to prove in it. Would I recommend it? Yes. Yes. Yes. It is an epic event on a scale like nothing I’ve seen. Make sure you can climb before you go. And bring a compact and a large rear cog (I had a 34×28 on my Cervelo) or else you will suffer. Apparently lots of people go over every year to do the event, see the hills then realise the event is insane, and then go home. One of the guys staying near us did this. 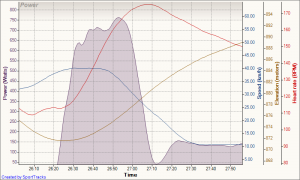 He arrived over on a standard crankset with a 25 on the back and he did suffer some. But once you have some real hill climbing experience, you’ll know what to expect and you’ll love it. Even if you are one of the people who spends 3 hours walking up the Alpe at the end of the day, you’ll still love it. Getting around is an achievement no matter how you do it. Flights at 12, day begins at 7am – because it is a Sunday and buses decide to be in frequent. I guess it is better than last trip where there were no buses. It was made slightly better as Burger King has a Double Cheese Burger, small fries, small drink for the grand low price of €3.50. At 10am, it becomes the breakfast of kings. Things were continuing along their path of general goodness when we landed in Geneva. I was of two minds about the car however we ended up with a 5 door Toyota Auris. This meant no unpacking of the bikes to fit them into the car – seat folded down and away we went. AC too. 5 minutes from the car park, things did start down hill when the GPS decided it didn’t know the road we were on. Even the main motor way was a different area. Quick food stop sorted it by reselecting the maps. I guess its a case of check PROPERLY before you go. Food is where things started to fall down. We built up the bikes and went off to find a restaurant. Pizza and chips ordered – pizza arrived. After we finished the pizza, we reminded them about the chips only to be told, sorry forgot to put your chips order in, and the kitchen is closed. Can do desert. I guess they were saved by the Cart D’or ice cream. Very very nice. Today started hungry and tired. Yesterdays mishap with food didn’t sit well. And it seems it gets ridiculously bright here ridiculously early. So all in all, not a good night. 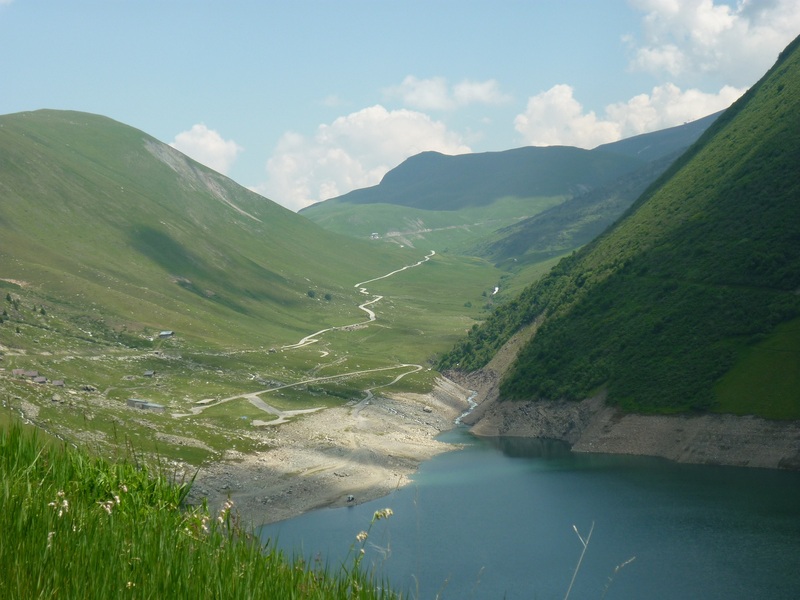 The cycle rolled out around 10 and continued down a long straight road until we start up the Col du Glandon. Being me, I really hadn’t spent all that much time studying the profile so the climb mostly worked out easier than expected. It goes up, down, up, down again, back up to the top. With breaks to re-group, it was handy enough. The heart rate was one difference. First climb, I started by holding my pace to see how I was feeling, wait for the legs to start to burn a little. This stopped quickly about 200m along the road at the first corner. 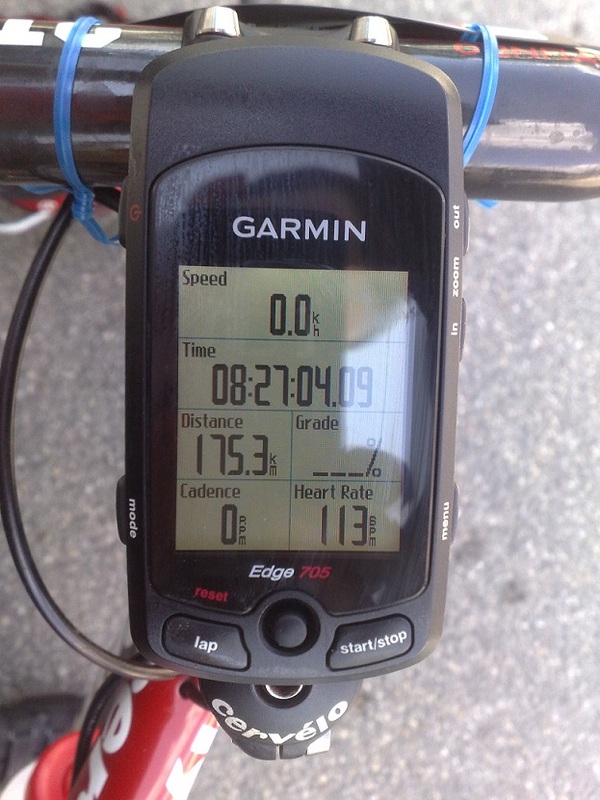 Looking at the Garmin, HR of 175, with no burn in the legs. Stopping at the first corner, we waited for around 30 seconds to re-group after maybe 1km of climbing. Strangely I hadn’t recovered, at all. It took another minute or two before I was back to normal. 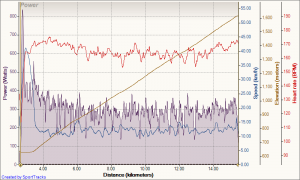 Immediately my pacing strategy changed to one based on HR, not power or perceived exertion. While the climb itself was a near sustained 10%, it wasn’t physically hard per-say, it was the heat that caused the problems. Lots of constant sweating meaning lots of constant drinking, and lots of nuun. I generally held my own which was nice, actually held my own all day. A Scottish guy who is staying the B&B did beat me up every hill but other than that only two other cyclists passed us. They were fairly milling it along too. Both in the drops working hard. Yes it doesn’t mean much but it is nice to be doing the passing. And yes it’ll be different on Saturday. The descents were mostly ok however I need to look at my brakes. Rear isn’t working as well as it used to meaning I nearly cooked it on the second corner of the first descent. Loose rocks on the road too. Anyway it is better to relax during the descents and recover. Overall a nice easy enough ride. Need to watch the water tomorrow. Think it was 3 and half bottles today however the mountain fountains are very cold and very nice. So it turns out no one here eats until 7pm. Yes we had a bit of after ride pasta but it was stressed that it isn’t lunch, and it wasn’t. Walking around the town, restaurants were open, just not serving food. Like honest. A trip to the supermarket resulted in some cans of coke, crisps and jellies. They helped but not enough. Google came to the rescue in a way by finding a bigger supermarket. This gave us bread, ham and cheese for rolls. By now it was 7pm so off for a burger and chips, mixed tapas to start. However tie in that I normally eat regularly and this was no where close to regular, I didn’t finish the meal, something slightly worrying. Even now, a few hours later, my stomach still hurts a bit and my head hasn’t recovered. I’m also tired from the lack of sleep last night. Overall, the worse I’ve ever felt after a days cycling – last years Wicklow 200 included. Tomorrow we have sorted some cereal and more bread to food after the ride. Hopefully sleep will work better tonight. And the restaurant we were at again tonight has a restricted food menu during the day. Only hours they don’t serve is 5:30 to 6:30 which I think we can work around. The morning shall be interesting. Luckily today began in a slightly good way. Last night gave way to more sleeping, a bit with the waking 2-3 times for toilet breaks, but that is one of the side effects of drinking so much water. And honestly, I’d not change it. Waking up in the morning without sore legs, or stiff legs, or tired legs really is something. The morning started downhill from there. My pre-existing stomach cramps / pains decided to make an appearance meaning I almost delayed us leaving in the van for the trip to the Galiber. Our drive took us along the route yesterday and up the Glandon. Strangely it seemed a lot harder in the van than it did from memory yesterday. The descent from the Glandon, well that is another story. While it looked a bit nuts while viewing the first bit, when we started driving it, the insanity hit home. Steep sweeping roads with no walls or barriers. The road from the descent to the Telegraphe, reported by many to be the hardest part of the event, is, well rolling. Ups and downs along the motorway. A group will be useful but pacing more so. Staying too hard along here and you will not recover on the Telegraphe. Conversation in the van also alluded to how the day might work out position wise. The two new guys who joined us yesterday seemed fit – was is in the UK Navy. However just how fit became apparent when the conversation turned to Ironman events. It wasn’t a case of oh different people have done an Ironman, but just how many they had done. 6 to be exact, including Kona, and posting a time of 9:03 in one, enough to shock one of the other guys who had done 2 Ironman events. Our day cycling day began in St Michel De Maurienne. Short 2km before we were on the Col de Telegraphe. 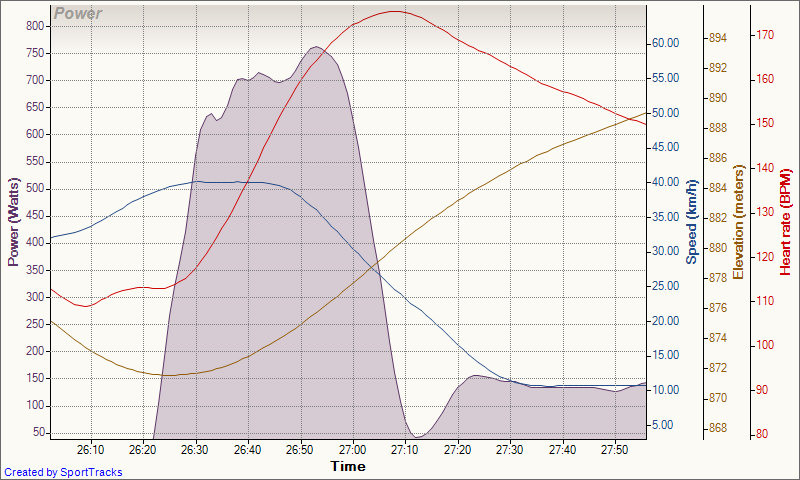 I remembered some of it from the few ascents I did on the Tacx Trainer that I have. While it was months ago, we did remember there would be trees. Unfortunately, we did the climb between 12 and 1 and well, trees on the side of the road don’t help give shade when the sun is directly above you. About 4km from the top, I had one of those moments. The times when your life looks like it may end. Luckily I was not in a coherent enough state to fully realise things but basically a truck decided to overtake me on one of the bends. He got the front of the truck up beside me when a jeep coming the other way came into view. This forced him to brake and start quickly moving to the side of the road. But this was a hill, so I wasn’t going fast, and I was at the side of the road. So yes, he started moving right towards me. Not something I ever want to repeat. Climbing the Telegraphe got easier near the top too. Be this from it levelling out somewhat or the temperature dropping, I’m not sure but it went faster and felt easier. The descent to Valloire went well. Nice and relaxed, decent pace. Exactly how you want it. We did get slightly lost at the round a bout taking a few spins around before some more cyclists arrived to direct us along the right path. Starting from 1400m, it really wasn’t all that hot on the Galiber. But this suited me. It was a few km up the road before I needed to start zipping up the top but I never felt cold. 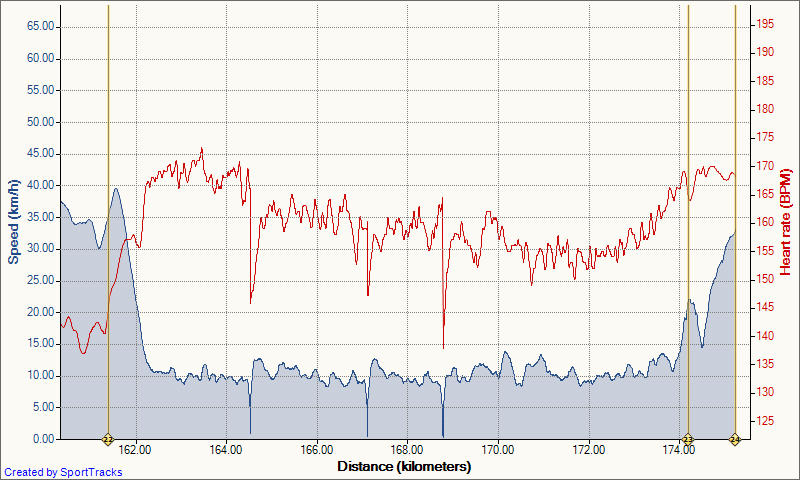 Keeping the pace steady is actually easy enough on hills like this as the grade stays constant. My stomach did make a grumble about 6-8km in, not sure exactly where. But I took this to eat a bar. Out it came and then the grade dropped down to 4-5% for the duration of my eating before going back up to 9%. Honestly, couldn’t have planned it better. I did have to pop a gel further up the hill too, about 40-50 minutes later. Climbing long climbs like this is strange however. I remember rolling by 10km to go and being like, yeh, getting there. Less than an hour to go. Then I remember rolling by 5km and thinking hey, only a few minutes ago I was going by 10km, but I also remember 9km which is strange. 2km to go was one of the first times I looked up to see where the road went. It took a few seconds to register but the tiny signs at the top became visible. Everyone else in the group actually made a similar comment too. You think you are nearing the top and then you see another 5 or 6 switchbacks. To top it off, the top 1km was closed off to cars due to snow / snow damage to the roads. Local council guys were up their sweeping some stuff from the road surface which was slippy stuff. Fully seated and the rear wheel lost grip at one occasion. I wasn’t the only one either. That last 1km was the hardest of the lot too. I had stopped for a bit at the fence wondering what was happening before picking up my Gilet and arm warmers and going on up. Didn’t help the legs. Altitude is a funny thing too. My HR was down. My power was down. My speed was down. My breathing was UP. And quite a bit. During the descent to Lautaret, I could feel the air getting heavier and my breathing getting better. Strange feeling. Sitting at the hotel in Lautaret, dark clouds could be seen in the distance. Phil (our guide) said there was heavy rain in Bourg d’Oisans. I decided to push on and try miss as much of the rain as possible. and looking down I saw the problem. Pea sized hail stones. 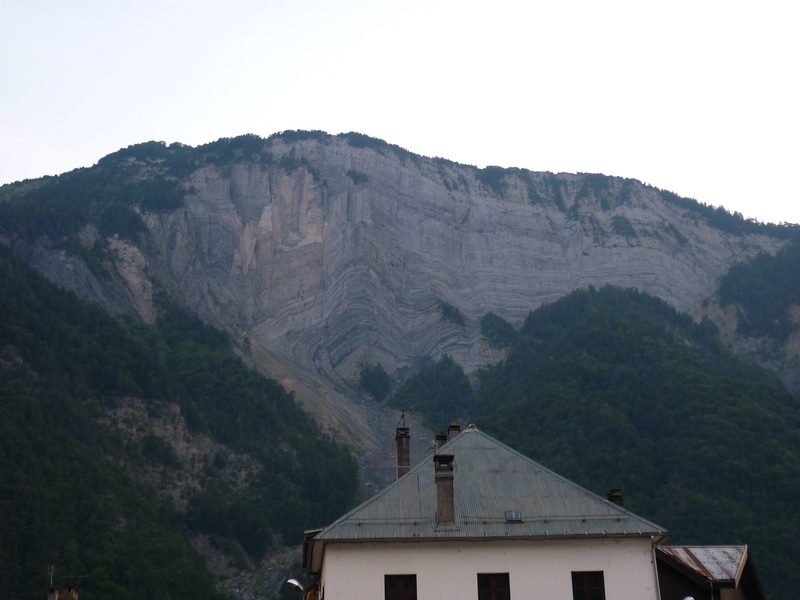 Now the profile from here to Bourg is mostly decent on just about every profile I’ve seen. The reality is that it isn’t a descent all the way. It levels off in places or sits at 1 and 2% which is up hill. Multiple sections were at 5 and 6% too. All told, it was bloody hard. To make matters worse, at one point it started raining. But heavy rain. I knew something was up when it started to hurt my head through the holes in the helmet. I really knew something was wrong when my spokes started to make a pong noise every now and then. Stopping at road works and looking down I saw the problem. Pea sized hail stones. Pushing on because well what else was there. Luckily I guess it stopped and I started to dry out. Just as I was almost fully dry, it started to rain again. Once I was nice and wet, it again stopped. Again leaving enough time for me to dry out again. Then it decided to really open up. The last 15 minutes to Bourg were wet. Really wet. Similar to the Swords Sportive a few weeks ago wet. Even now, a few hours later, my shoes are still soaked. I ended being able to squeeze my gloves and watch water drip out. Today was to be a run up the Alpe d’Huez. We all were of two minds as if we should go all out, or should we relax and enjoy the climb. As the graph above shows, I decided to hammer it. First think to comment on, something the profile graphs miss, the start is meant to be 10% and then drop to 8% after about 1.5km. Well it doesn’t. 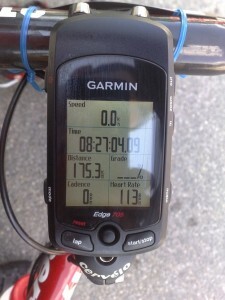 It kicks up to 13% from what I saw on the Garmin. So me hammering it along the flats and up the hill a little really backfired for the first while. Took a good 10 minutes to feel settled on the hill. Overall it isn’t too bad of a climb. Yet I say that while ranking today as the hardest day of the week so far. In the hour climb I took two gels and nearly finished both of my 800ml bottles. 1 had nuun and the other a High5 sachet which also had caffeine. While normally my High5 is great, the caffeine did not sit well causing my heart rate to go up everytime I drank some. Not something you want when you HR is sitting high already. Edit: My time makes me the fastest Irishman who stayed with Tour d’Oisans. Today looked like it was started good. I woke at 5am ish, which is the longest sleep I’d gotten so far. Thought I’d be able to get back asleep too until my stomach started at me. Ended up having to go downstairs and eat a bowl of cereal before it would pass. Really a case of not eating enough, and eating enough is strangely hard here in Bourg d’Oisans, a town for cyclists. Due to the stomach parts, I opted not to go with the other guys out on the cycle they were doing. Had hoped I’d get out later in the day but it was around 12 by the time my stomach had cleared itself. The time was spent washing clothes and giving the bike a good look over, including replacing the rear brake pads. Descending the Alpe yesterday, I could smell the pads during the middle section until I started over taking the cars. Registration took place at the top of the Alpe, and instead of driving up direct, we decided to head up via the Col de Sarenne and down to Alpe d’Huez. I won’t say much about this climb as it was done in a car except that it was almost as hard in a car as the Alpe was on a bike. It goes on and the road surface near the top isn’t the best. Then from the top to the Alpe, it has small sections of pavé in a deep V like section, used to channel the melt water from the mountain. Not something I’d like to cross on a bike. As for the registration, it was surprisingly smooth. Not too big of a queue and what there was moved very quick. Once inside, we took a look at some of the merchandise available (I got a Marmotte Jersey and T-Shirt), then signed in by giving the form and medical cert in exchange for a bag. On the way out you scan the timing chip to ensure it is working and then you are done. 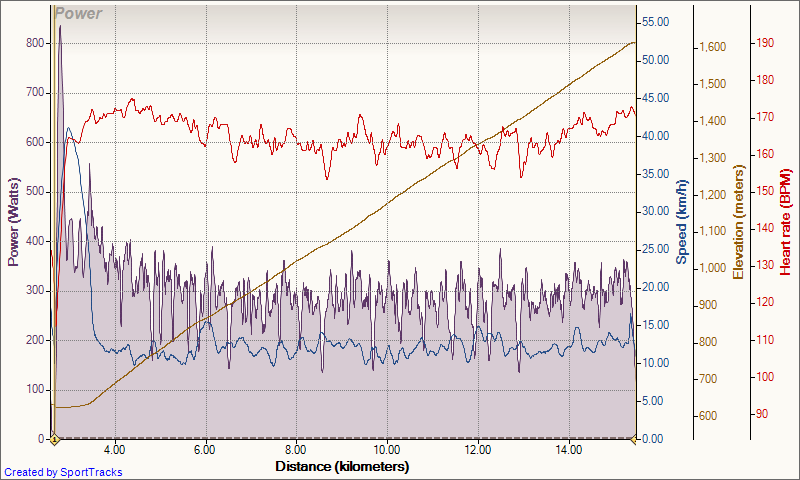 A short spin, less than 15km with a small gentle uphill near the end, then back the same way. 30km Total. Or so they said. I did my usual sit in to warm up for a few minutes then started some shortish, fast speed buildups. Then onto two larger sprints. One of them allowed me to set yet another Personal Best for power output, this time in the 30 second grouping (according to PowerAgent for my PowerTap). Below is one of the sprints. Small downhill allowing the speed to go up before a slight uphill. I built up the power and give the final push near the end of the cycle before relaxing out. There was also two or three high cadence drills before we turned a corner and started uphill on switchbacks. For those of you who have never climbed in big mountains, switchbacks mean steep. Immediately we were climbing at 10% leaving me slightly suffering due to the above output. Not fun. Lucky the climb only lasted about 5 minutes before we reached out stop point. Roll on to the day. Starting. Finishing. Celebrating. Makes the event so much more real and keeps the training so much more required. Today marked the point of no return for the Matmotte 2010. I booked my place with Tour d’Oisans for a 8 night trip to do event. Last week we confirmed our training week down in Malga with Vamos Cycling and I’ve already begun the training on the Turbo trainer for it. I’ve yet to read a “happy” review of this event and it does seem like a bit of a challenge. Bring it on I say, bring it on!